Home / Media / Cotswold Wildlife Park’s first hand-reared Rhino calf makes her debut. 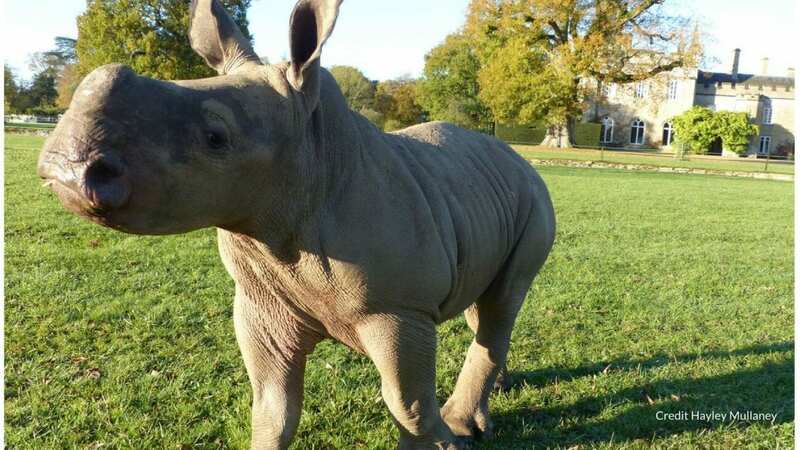 Belle (pictured above) is the newest addition to the Rhino family at Cotswold Wildlife Park & Gardens. She is the fifth White Rhino to be born at the Burford collection and is Nancy and Monty’s third calf. Belle’s start in life was, however, unlike anything the animal team at the Park had experienced before. Due to a medical issue soon after birth, Belle became the first hand-reared Rhino calf in the Park’s history. Hand-rearing the second largest land mammal was a decision not made lightly, as Curator of Cotswold Wildlife Park & Gardens, Jamie Craig, explains: “During the night we got a call from the Mammal team to say Nancy had given birth and all appeared to be well. When we came in to inspect the calf, she was standing next to Nancy and seemed strong. However, when she attempted to walk (always an unsteady moment for a new-born) she stumbled and her right foreleg twisted. She was essentially standing on her carpus joint – a sort of wrist equivalent in humans. Although she righted herself, we noticed that this area now appeared weaker. She stumbled a few times before we finally left her, standing correctly, next to Nancy. Leg weakness and poor coordination are commonly seen in newborns of many species so we left for the night fairly confident that she would be much stronger and stable in the morning”. The X-rays showed no evidence of a break or dislocation. Nerve damage (either pre or post-birth) was believed to have caused the foot to twist. Cotswold Wildlife Park has a ‘hands-off’ policy with newborns and only intervenes when absolutely necessary. With the results back in, Jamie explains the next stage: “The decision was made to cast the leg to allow the nerve to recover – a risk in itself as there is no guarantee of success. The initial plan was to cast and reunite Belle and Nancy straight away. Once the cast was on, we had an immediate issue in that the calf would not rouse from the anaesthetic – hardly surprising for an animal less than 24 hours old. After considerable time and effort, the calf finally stood but was struggling to walk with the cast and was visibly in a state of distress. At this point, it was clear that the calf could not be reintroduced to Nancy as she had not yet mastered walking with the cast and her erratic behaviour would have agitated the mother, putting her in an extremely dangerous and potentially fatal situation”. White Rhinos (Ceratotherium simum ssp. simum) have always been an important species for the Park. The first Rhino arrived at Cotswold Wildlife Park, founded by Mr John Heyworth, in 1970. Pictured right – archive photo of Bull, one the Park’s first Rhinos, being chased by a Grévy’s Zebra. She was named by Head of Mammals, Hayley Mullaney, after one of the characters from her favourite Disney film – Beauty and the Beast.